I absolutely love looking at visions of the future from years gone by. You know, like the magazines from the 1950s that predicted we would all live on lunar colonies by 1968 and smoke cigarettes that gave us superpowers. Sometimes, these predictions are utterly ridiculous in retrospect; other times, they're scarily accurate. 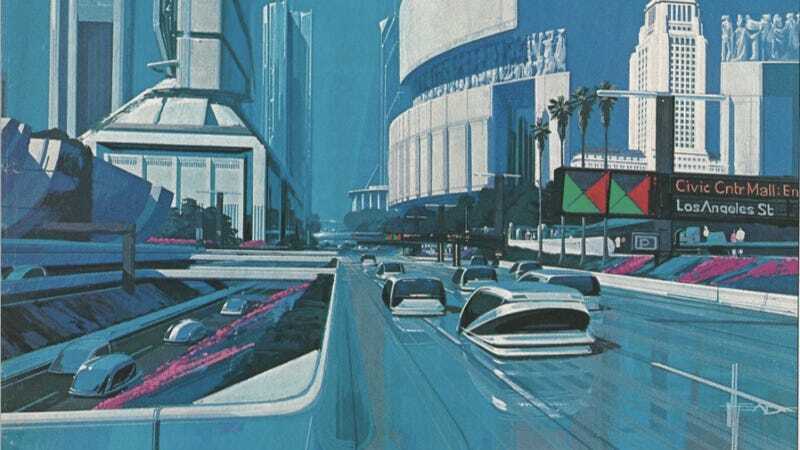 Recently, the Los Angeles Times dug out an April 1988 issue of the Los Angeles Times Magazine that was devoted to what life would be like in the far-flung future year of 2013. (That's NOW!) In that issue, they made an assortment of predictions about what life would be like for Angelenos in 25 years. It was more than just writers using their imaginations — the Times spoke to a variety of experts in the fields of technology, economics, design and other fields to make their points. What interested me, of course, was the section about the cars of 2013. And you know what? There's a lot they got right. The section is called "Smart Cars," and it's on the fifth page of the PDF they posted. Why don't we take a look at some of them? CHANCES ARE THAT in the next 25 years, Los Angeles won't lose its ardor for the automobile. But the cars in which we spend so much of our time will be smaller, more efficient, more automated and more personalized, industry experts say. "Vehicles will become more suited to the needs of each individual," says John Schinella, director of General Motors' Advanced Concepts Center in Thousand Oaks. "Some will be more utilitarian, more pointed as to what their uses are, but shapes, sizes and needs will be vastly different." I think you'll see a lot of special—purpose vehicles," agrees David Turner, director of Advanced Concepts Design for the Ford Motor Co. "There'll still be large and small cars, but there'll be a greater variety of vehicles available, including extremely small commuter vehicles." For instance, Schinella predicts, we may one day be able to drive around Los Angeles in a "sports-utility" vehicle that can go from being a two—seat sports car to a beach buggy—thanks to a plug-in module. Imagine that — a "sports utility vehicle!" Although this is kind of funny because there were certainly SUVs running around in 1988, even if they weren't called that and even if they weren't nearly as ubiquitous as they are today. Also, we haven't figured out the whole "transforming car" thing yet, unfortunately. And, Turner says, the variety of models available in these "niche" vehicles will be astounding. For example, consumers will be able to choose from scores of van models—all different. These could include a "starter" van for families, a commuter van that would be the "Lear Jet of the highways," a sedan that could convert into a van and even a van that would handle "like a Mark VII." Again, we don't really have transforming cars, but we do have big and small vans and SUVs. Turner says the car of the future will be defined by increased efficiency. By 2013, the engine and mechanical parts of the car will have become smaller, he predicts, leaving more space for people and cargo. Schinella sees autos 25 years from now as slimmer and taller than cars today, with more spacious interiors. Turner believes that aerodynamics will "always drive the shape of the car" and that auto interiors will be "infinitely adjustable." And, he adds, tremendous progress will have been made in auto-mobile safety. Absolutely true on all counts. We've come a long way from the tiny, boxy cars of the 80s, and we've increased our fuel efficiency, which is more of a concern for automakers than ever before. that will control a number of devices. Right again too. How many safety technologies that started with high-end luxury cars are now standard equipment on all models? A lot. They also nailed the "central computer in the car" prediction, although cars were running OBD systems by 1988. But now, they have an even bigger role than ever before, including operating the array of sensors that are equipped on modern cars. A sonar shield, for example, will automatically brake the car when it comes too close to another. If something malfunctions, diagnostic features will tell the driver what's wrong. Doesn't this sound a lot like the laser- or radar-based adaptive cruise control and collision-detection systems we've been seeing on luxury cars as of late? Autos will also come equipped with electronic navigation or map systems. Once the driver programs a destination, the system will pick the fastest route, taking into account traffic information, then give the driver the estimated time of arrival, continually plotting the car's position on a map. Here's another obvious one. Nav systems are everywhere, and if you don't have one, you can use your smartphone instead. Another part of the story goes into the daily commute of a 2013 Angeleno named Bill, who drives "a cobalt blue Apollo 3000" with an interior that automatically adjusts the interior based on his frame. Okay, we don't have that yet, but we do have power seats that remember your settings. Bill also drives his Apollo 3000 with a "plastic key-card" that opens it up and turns it on. This sounds an awful lot like the smart keys and proximity keys that Jason rails about from time to time. His car also has a windshield that darkens when it's sunny out. Our windshields don't do that yet, but newer rearview mirrors do adjust based on darkness. His car also has a digital speedometer, which were big in the 80s, then dropped off for a while, and are now coming back. Bill also notes that his "commute downtown takes three times as long as it did 25 years ago." I don't live in L.A., but I wouldn't be surprised if that were true. The story on the future world of 2013 is a fun read, and you should check it out. Any guesses what cars will be like in 2038?